Neither can I .. :( I hope, this will be fixed soon. Can someone please help me? I've been trying for several hours to get SAM to work to no avail, I have no idea where to put the files, what to do, or anything. I tired putting the core, texture and vanilla refit into the main Skyrim folder, loaded up my game and had no luck. Please can someone get back to me as soon as possible on how to install and use SAM that would be great. Thanks you. Nevermind this, I just figured out how to do it, though I am still wondering, is it possible to make characters bigger than the sliders that are provided? Download this file > select SAM-Optional-B3lisarios-Console-Slider-Extender-SetPQV.7z. The file comes with a readme file that tells you how to use it, so be sure to read it! im sorry about this out of topic question.but does anyone know what enb use in the screenshot ? Eep, sorry for the late reply! I think I used Photoreal ENB. 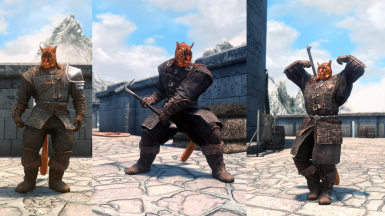 http://www.nexusmods.com/skyrim/mods/50483/? Your racemenu patches are broke and damaged. SAM no longer need RaceMenu patches, and here just for legacy use! From there select " Download this file" and download the file called "SAM-Vanilla-Skyrim-Refits.7z". As for now, I don't believe there is Immersive Armors refitted yet. Do you mean that without wearing anything it shows "male parts"? You can disable that by going Mod Configuration Menu > SAM > General Settings. From there uncheck "Enable Schlongs" option. After that every male should be wearing underwear when unarmored. Quick stupid question (sorry eheh), these outfits will still work without the SAM body mod, or not? I haven't tried them without SAM, but I'm pretty sure they will not work properly. I dl this mod from lady m's site. I didnt't know this was also here. Thank you for ur work. Just a question. The blind moth priest's sandals had a different color seam bug from the vanilla which is carried over to this mod. I'll check that issue when I get a chance. Maybe next weekend. Awesome. Do you intend on doing your own version of the vanilla armors too? 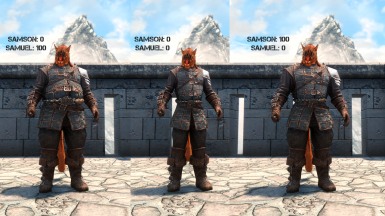 Even using the latest 3.1 pack from ladymoraine, theres a number of armors that are bugged out and do not scale with SAM and produce neck seams and clipping, because the armor won't scale with the body, ect. The hide armor for sure, im in the process of creating .bats to quickly equip armor sets on npc's to see what else is bugged. Edit: Yeah, the hide armor is definitely borked. As is the iron armor piece, both normal and 'banded' variants; there are neck and armpit seams. 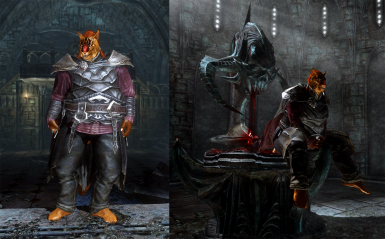 The Fur Bracers also don't scale/clip, and the leg clips through the leg portion of the 'studded' armor. Seconded. When I first saw the screencaps I was expecting empty trays of lasagna. Your Khajjit needs to stop eating all them sweet rolls and get on a diet. Maybe 3 cave raids a day should do it.